Kyoto is recommended by most as the second place to visit in Japan, following - of course - Tokyo. The city is very different to its touristy brothers, the capital and popular Osaka, as it is enriched in culture and tradition. There is a cosmopolitan side with a variety of shops, restaurants and bars, and most importantly a backpacker vibe. Kyoto is one of those cities where you have to see the ‘top spots’. Most cities will have the top places to visit which sometimes can be overrated, however Kyoto’s top locations are very different from those you’d see in any other country, and in my opinion they are unmissable. I’d say the main places to visit centre are The Golden Pavilion, Fushimi Inari and Kiyomzi Dera. All three are different sights and amazing spectacles to see. 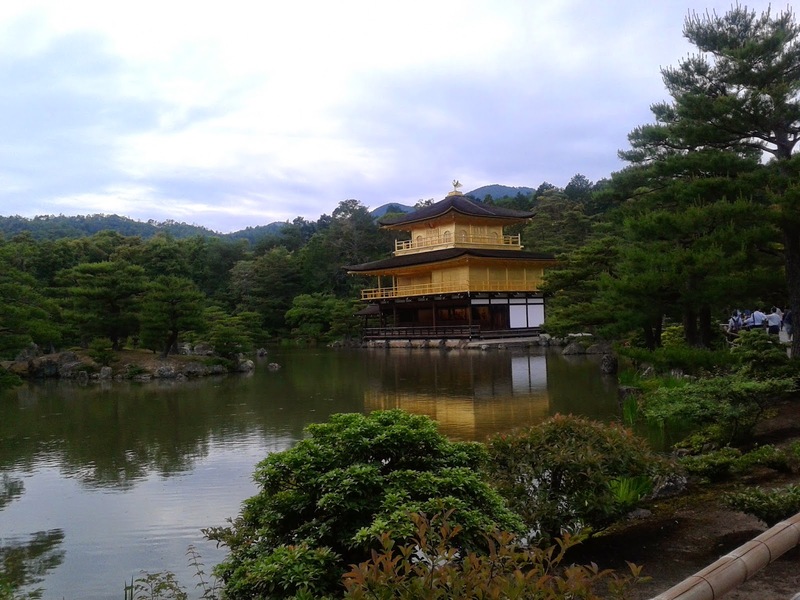 Firstly, the Golden Pavilion, which is probably one of the most, visited attractions in Kyoto. Situated just a tiny bit out of the centre of the city, but completely accessible. 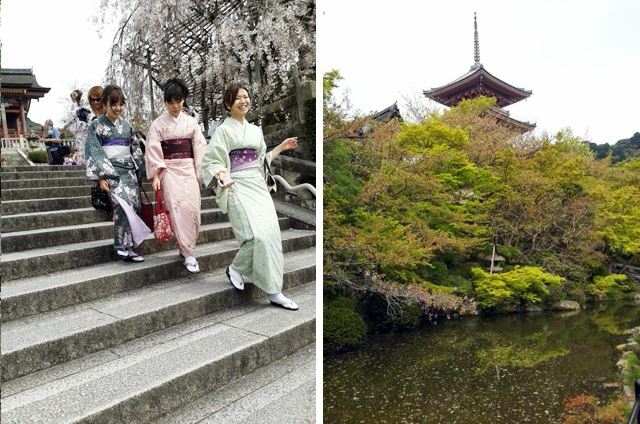 Expect beautiful gardens and surrounding forest with the jewel in the crown being a solid gold temple in the middle…The sight itself is big enough to not be trampled by fellow backpackers, and at a mere 400yen to enter, it seems a shame to visit Kyoto and miss out on this gold lover’s dream. Secondly, I’d recommend taking a visit to Kiyamzi Dera, a very easy place to get to from the centre of the city. This sight is surrounded by beautiful forest and sakura, if you’re lucky enough to visit during the cherry blossom season. It is cheap to look around and you can trek to see some more beautiful scenery and views of the city. This sight is peaceful but yet busy with tourists. Spend some time here to enjoy the nature and experience the picturesque waterfall at the end of the journey. 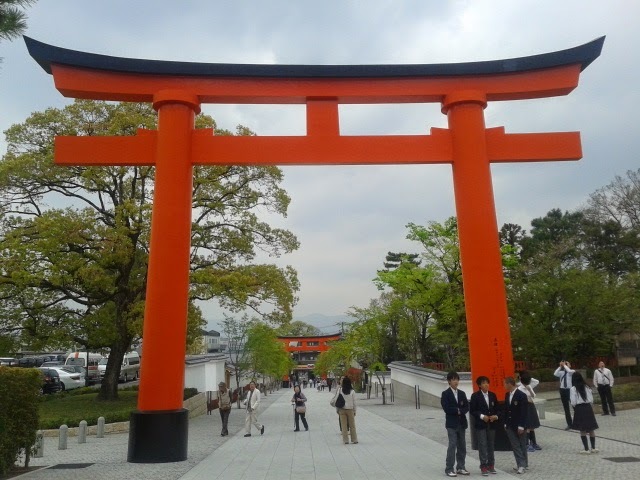 Thirdly, take a train to Fushimi Inari. If you know anyone that’s visited Kyoto recently, you’ll know doubt know the image of this sight from a friends Facebook cover photo, which many of my friends now don. 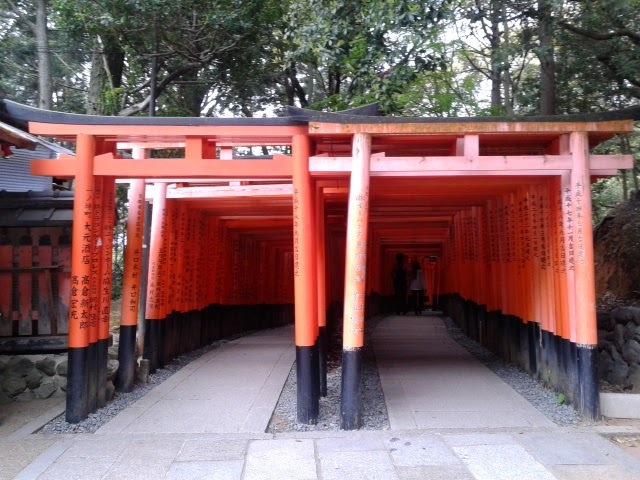 Fushimi Inari is a series of 1000 tori gates, which companies buy to bring themselves good luck and good fortune. The gates are replaced every ten years, and cost a ridiculous amount of money. The sight itself is free and the train journey is only about fifteen minutes from the centre of Kyoto. The tori gates last about 4km of winding path, which if the weather is cool, is worth doing. You’ll find some hidden personal family shrines, and you might be lucky enough to see a family praying at their shrine which is quite surreal and a somewhat humbling experience. Finally, the sight has a beautiful lake in the centre where it is worth just taking in the peace and calmness of the tourist attraction. Well, what else can I do? Kyoto has a million and one shrines and temples, which are all great to see, but in my ignorant opinion once you’ve seen one or two then you’ve seen them all. A lot of the shrines are quite similar, but it is worth seeing a few. Apart from these, take a walk around the Gion district to spot a geisha or two. You can enjoy a show there but it is quite expensive. 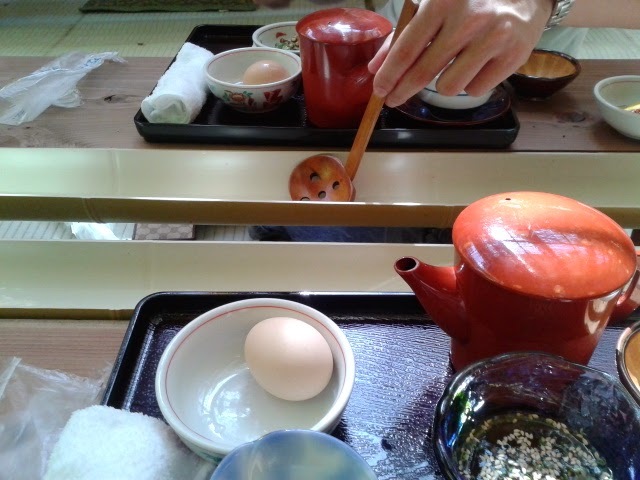 After this, head slightly south of the Gion district to experience 1000 masked Buddha’s. The sight doesn't allow pictures to be taken but the Buddha’s are worth seeing as they are quite surreal and they show a different side to traditional Japanese beliefs. To see more beautiful gardens then head to Ni-Jo castle which is a good sight to visit in good weather. And, perhaps take a trip to the Imperial Palace, although overall surprisingly not that amazing a sight to see. If you like your museums, then Kyoto has a handful. For people who love manga and anime, then visit the Kyoto Manga Museum, which I believe is the biggest of its kind. However, as I’m not a manga fan I did find this quite dull, especially because I can’t read Japanese. Other museums include the Kyoto National Museum which also houses a film studio. Pretty interesting to visit and worth exploring on a rainy day. You want to head to Kawamachi Street for the drinking holes. It’s in the centre of the city and ask any local, they’ll know where you mean. There are two mains streets of ample bars and restaurants. In true Japanese style, they are the kind of bars that are tucked away in what would look like a block of flats, if it wasn't for the neon signs and array of people you would never find them! Bars with five chairs are not uncommon in this area, which is great to meet locals and talk to the bar staff for the local insight. Some bars you can’t tell what they are like until you step in, then it can be awkward walking out when you see a lonely bar tender and five empty seats. However, I believe I’ve found a few personal delights. Try Milan’s Bar which is in the centre of Kawamachi. A karaoke Turkish bar with a great atmosphere. Then head to a Walking Moon bar for 200yen cocktails! Small drinks but not small on the liquor! Then try Bar Ing for a rock n roll with the likes of the Rolling Stones, Red Hot Chili peppers and The Who blaring out. The trick for finding good and unique bars in Kyoto, is to make friends with a local. Find some locals in their twenties and they’ll point you to the hot spots and tucked away gems. K’s House and Khaosan Hostel are two hostels I stayed in and two of the best I’ve ever stayed in. Khaoson was in the perfect location, right at the centre of the city. Good common room and kitchen and comfortable rooms and showers. However, no bar, but a big enough common room where many backpackers met and then ventured on to nearby drinking venues. K’s House was a little bit far from the centre. However, it is closer to Kyoto main train station, and still walking distance into the centre which I did after many a night out. This hostel in my opinion is better than Khaosan for common room size and comfort, better kitchen and bigger rooms; it also has a bar next door which provides discount for hostel guests. Both affordable prices for the facilities they have, and both offer great itineraries for the city. 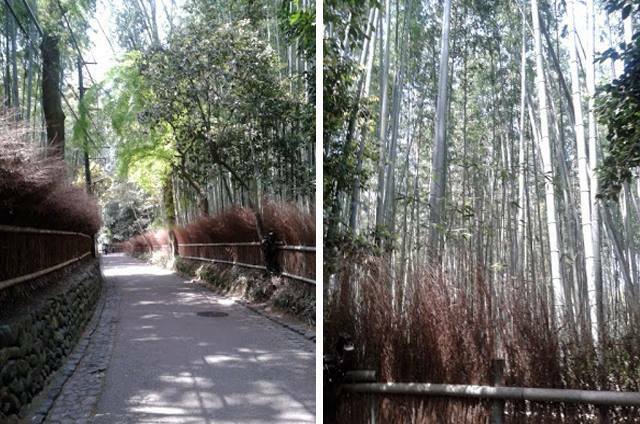 Arashiyama – home to the bamboo forest and monkey park. Easy to get to from the centre of Kyoto and usually tends to feature in most of the travel guides and must-see places. A nice town with good food along the riverside. However, the main feature is the bamboo forest, which I actually found a little disappointing. The forest is supposed to host a million and one bamboo trees, which for a few metres is pretty, but then a bit dull. However, for a more exciting visit then trek to the monkey park and loads of the primates just doing their own thing. Uji – for anything and everything green tea. A nice town with a fair few shrines and good views along the river, however the main attractions are the restaurants with the green tea noodles, cakes and icecream. Highly delicious, and worth exploring for half a day. Kibune – not in the typical travel guides but a town worth visiting. Just forty minutes out of Kyoto and famous for its forest walks and it's nagashi somen. Nagashi somen is cold noodles which you catch from water flowing bamboo shoots. Find a restaurant next to waterfall and enjoy a great view with some cooling and delicious food.